Unlike the Cornfather, I really hate to make a fuss in restaurants. As long as the food the waiter brings me is a close approximation of what I ordered, I’m cool with it. Really, someone who has access to your food away from where you can see it, is someone who I choose to be extremely polite to at all times. I worked at a fast food restaurant when I was going to college. I know what goes on. Believe me, you do not want to piss these people off. While I never did anything untoward, many of the other cashiers and servers were not as scrupulous. The things they did still have me waking in a cold sweat on some nights, clutching my blankets, a silent scream stuck in my throat. This reminds me of the BK incident that happened at a thruway BK a few years back and he kids got caught doing it. Love how spit is all in bold there. 😛 I myself hate making a fuss, but sometimes when the service or food is bad enough, I will make a fuss. In fact back during the summer, my girlfriend and I went to a local place and the woman who served us ignored us 98 % of the time. My girlfriend and I now have the nickname 31 and 67. I’m sure you can figure out why. 😛 Nice strip, and love the clever names for them! there should be a special punishment for people who get caught doing this stuff, Spanky. like, they should be forced to eat whatever food they tampered with. 🙂 and i love your nicknames – which one are you? 31 or 67? and glad you like the titles! When I am in those restaurants, I always get the fear of them spitting in my food. This takes it to a new level. XP And awesome new strip, at least they try to keep the hair out of it. Oh wait I forgot something, first!!! Actually I’m awaiting my comment to be approved by Mr. Bot, sorry. yeah, sorry Z – Spanky’s first comment got flagged for some reason so i had to approve it. there’s got to be a way that i can just automatically clear you regulars. I’ve noticed it asks for your approval when I have more than 1 smiley in with my text. *shrug* Seems to be the only time it asks. It kinda depends on the comment system your using, but there probably is a way if ya look around long enough. yeah, there’s gotta be a solution. i’ll try and google it later. To be honest I rarely ever eat out after that summer working at a restaurant, there was some horrible acts of revenge some of those waiters pulled. Then again, I may have laughed a few times when they left without even realizing what was put in it. it took me some time to start eating fast food again after working at one of those restaurants, Z, but now i eat it, happily, at least a few times a week. i should probably remind myself exactly what’s in that food and start eating at home more often. Great line! But I has a questioning… Who actually had the strawberries and who the cake? The diet led us to beleive t’would be Jefbot, but in the final panel the cake’s still happily in front of JEFBOT.205_Just Desserts, Michael. You have confungled me once more, Master Schuetze. it seems a couple of you wanted the waiters to get revenge on CF, Nya! heheh. I’m right with you on that one, Jeff. sweet. yeah, there’s just too much risk involved when interacting with people who handle your food, SY. All I can say is UGH! 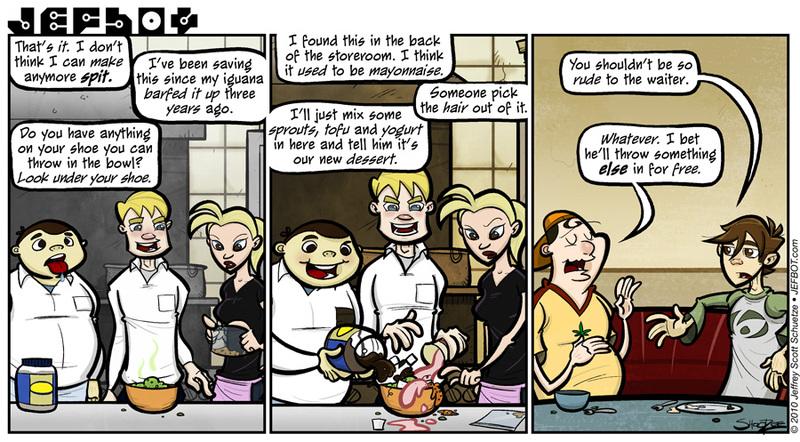 This strip really makes me glad I try to always treat people nicely or at least civilly. It takes a lot to make me be rude to someone – especially someone with a crappy job. I just went looking for Wil Wheaton’s recent mention of JefBot on his blog and couldn’t find it. (I found your comic as a result of his earlier mention of your story arc featuring him.) Can you point me to where he talked about you this time? Oh god! The memories! I’d never work on a fast food or any food service company (thanks heavens for that! I get sick just watching my mom cook ;__; but I love when everything is served and ready to eat! ), but my big big brothers did… and the things they told me they did when customers pissed them off… well, jef, I share share your experience of waking up in the middle of the night clutching blankets and in cold sweat. Really horrible. At least my brothers “swear” that they only did this when the customers were really really nasty without real blame on the part of the customers. Still… >__< another reason to only eat at mom’s. She won’t ruin a good meal if we’re “mean or nasty”. She would just ground us and give us no food. Noooooooo! We’ll be good, mommy! Give us your yummy food, pretty please!!!!! mombot’s food is awesome, too – in fact, she made some super-delicious enchiladas for my sister Lor’s bday on sunday! so good. First Rule of food. DO NOT PISS OFF THOSE WHO HANDLE IT. Haven’t you seen Waiting? saw the trailer for it but never checked it out, DJ. worth adding to my Netflix queue? Yes. Its hilarious. The second one isn’t the worth the plastic the disc is made of. i had no idea there even was a sequel! must be seriously bad. That’s nasty! … I believe there is a right way and a wrong way to ask for something while ordering… though I can’t be sure The Cornfather did it the wrong way (as we didn’t hear that part of the conversation) I can only imagine it was the wrong way, based on the vile going on in that bowl! P. S. Awesome artwork Jefbot! Jefbot’s body language and expression in that last panel is brilliant! As are those of The Cornfather! Well done! I like waiters and waitresses. But especially waiters. Before money started getting tight my girlfriends and I used to flirt the waiters up at restaurants sometimes twice a week. It was good fun and we’d get the occasional freebie for making that fella’s night. Never had to worry about unsavory stuff in that! Truth be told though, the best part about flirting up the waiters is watching my mom and her friends do it. Better then a Sunday night line up. Sizzzler…the GREATEST restaurant EVER invented. and even then, if i’m going to complain i have no intention of going back to the restaurant, on the off-chance that they remember me and i get some retroactive revenge. That’s it right there, that’s the evil power wielded by nefarious restaurant servers. The doom that they rain down upon the common man is but a fraction of wrath reserved for raising their precarious ire. This is one of the reasons that I prefer to cook for myself. After all; if I piss myself off, am I going to spit in my own food? ha! what a great, existential question, reynard61. hmmm. I worked in a restaurant once. I will never eat chicken wings again. LALALA! i don’t even want to hear it, Elwain! don’t take chicken wings from me!!! 👿 < - here's an extra angry smiley for ya, Shanna! i'm totally freaked out to hear your story 'cuz whenever that carousel starts, i'm always expecting the contents of my luggage to come spilling down the slide. now i know i'm not completely paranoid. Excellent story arc. I liked it a lot. We used to joke about keeping a bottle filled with “special sauce” for our customers. It’s amazing how some people treat the people who are making their food. However, at our restaurant we make their food in front of them, so the mean and nasty ones are safe. thanks, emikae! this mini story-arc is going to transition to the next one in friday’s strip. and your hypothetical bottle of “special sauce” = eww. and i’m sure you could find a way to sneak something gross onto a particularly rude customer’s plate. not that i’m suggesting that at all. too bad it wasn’t an italian dish (or was it?) like lasagna or spaghetti, IDTMRB; your brother could’ve just told them it was grated parmesan. I’m imressped! You’ve managed the almost impossible. Im going to barf. Seriously. Thats disgusting! heheh. i was getting a little nauseous just thinking about the Cornfather eating that mess, Maryz. you’ll know by the next strip whether he dodges that bullet or not. ha! but everything else is okay, right? I used to work as a busser at a local joint a few years back (gawd I’m getting old…), and while I never saw any spitting or anything going on, I was occasionally on the receiving end of those people who would flip out of there was so much as a pea missing from their plate. Let me tell you, sometimes the temptation to spit or otherwise “alter” the person’s food almost becomes justifiable. that’s why i don’t understand how people can treat their waiters rudely, Alexander! you’re just a bad judgment call away from eating someone else’s booger, spit or god-knows-what-else. insanity. and yeah, i’m the same way about not getting worked up about it. i don’t even have to curb my tongue since i really don’t get upset if something isn’t right about my order. we should all be nice to our siblings as well. who knows what their doing in the kitchen while you sit there & chat up mom and dad…. Xinda? WHAT DID YOU DO!!!? sadly, some people don’t even need a reason to do such things, Guus. i’m sure some just do it for kicks. I just glare when I don’t like a customer… and possibly yell if they’re wandering around the store and not paying attention to what they’re ordering. Seriously some of the things we COULD do when the food is right in front of the customers without them realizing is ridiculous. it drives me absolutely crazy when i see people being dicks for no reason, Sunolet! i either seethe silently or have to get involved if i witness someone being mistreated. urgh. makes me so. mad. and that’s awesome you got numbers for being nice! Aaaaannnnddd, I won’t be eatng fast food for a while. This is the main reason why I always eat at buffets or at fast food joints. I just can’t trust those people who are handling my food.